So….I guess it’s Girl Scout Cookie time? Another perk of being unemployed and rarely leaving the house – I have yet to be sucked onto the Girl Scout Cookie Train. I’m sure I’ll be accosted on my next trip to the grocery store. But here’s the thing. (There’s always a thing with me, isn’t there?) I’ve never been a huge Girl Scout Cookie fan. I usually end up buying a box of thin mints and a box of whatever the Peanut Butter ones are called, but only because I’m guilted into it. I don’t crave them. I can survive without them. What about you? 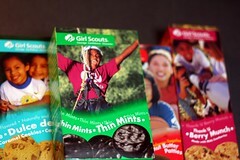 Are you a Girl Scout Cookie Addict? What’s your favorite kind?